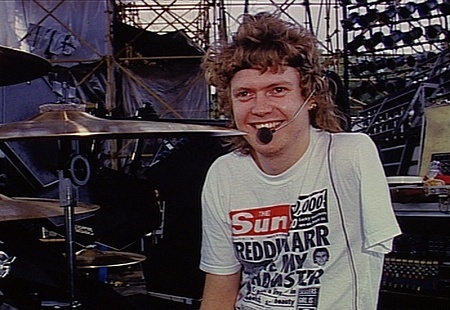 Def Leppard drummer Rick Allen was interviewed in April 2012 and the full archive text is available to read. My Global Mind have re-published an interview with Rick conducted by photographer/journalist Robert Cavuoto. Rick talks about his artwork, painting, favourite art pieces, Def Leppard's friendship and his return to drumming. He also talks about his nerves before the August 1986 Donington Park show in England. August 2016 marked 30 years since this famous event where Rick made his big comeback after a handful of Irish warm-up dates. The interview was originally published by Guitar International in April 2012 during the promotion of the 'Electric Hand: Rhythm + Change' art project. "I think the first time we played Donington. I felt so vulnerable, the prospect of having to play that show. I’ve never felt so nervous in my life. I kind of felt like a bit of a freak show. How are people gonna react? How are people gonna respond? Are they gonna accept me? Are they gonna start throwing things? It was very uncertain." "He introduced me. It was like taking a cork out of a bottle of champagne. The energy was overwhelming. Right there and then I felt that I had arrived and I had arrived at a new part of myself. "When Steve Clark and Phil Collen showed up, it was just so cool because they made me realize our friendship. The music and the time spent with the band were really irrelevant. At the end of the day, it’s that question in your mind: why are we doing this? When you’ve exhausted every possibility, the common denominator is always gonna be friendship." "It was really important to me and to this day, that there’s always that bond. If for whatever reason we’re not playing music together anymore, I honestly think there will be some sort of contact or friendship that is firmly intact, that can never be broken."